Delegates at the fifth annual Appetite for Growth Conference were told that the local food and drink industry must capitalise on ‘Big Data’ if the sector is to achieve the growth targets set out in the ‘Going for Growth’ report. The conference, which was organised by the Northern Ireland Food and Drink Association (NIFDA) and sponsored by Invest NI, Bank of Ireland UK, Sysco Software, Deloitte, and Armagh City, Banbridge and Craigavon Borough Council, aims to empower local food drink companies with knowledge and insight that can add value to their businesses and improve their competitiveness. Dr Geoff Simmons from Queens University Management School, advised delegates that the key to sustainable growth for food and drink companies is adopting a marketing strategy based on sound market intelligence. Dr Simmons is currently involved in a three year project, funded primarily by Invest NI, which is supporting local agri-food firms to improve their marketing skills and market knowledge. To date 22 local companies have engaged with the project team, with plans to recruit more. “There’s a lack of understanding amongst local agri-food firms, particularly the SMEs about what marketing really is,” said Geoff. “Smaller companies typically don’t invest in market intelligence such as dunnhumby, Mintel, and Kantar Worldpanel, whereas their larger competitors do. This puts SMEs at a distinct disadvantage. Overall the sector is great at focusing on production and driving efficiency, but smaller companies, as well as some larger firms, need to improve their capacity ‘to do’ marketing in a more systematic and less ad hoc way. “Within a rapidly changing, increasingly competitive environment, the case for a better understanding of consumer needs and wants is strong. Companies need to utilise the market intelligence available to them to analyse who their consumer are and what they want, before they decide on the best consumer segmentation, targeting positioning strategy and marketing mix for their products. Market intelligence has the power to transform businesses but only with a firm grasp of how to do marketing, and through this project we are aiming to integrate them,” said Geoff. Tony Brown from Sysco Software also spoke on the benefits which can be realised through utilising ‘Big Data.” “Many companies are paying to capture data but failing to integrate it and utilise it properly. Making data work efficiently is essentially learning how to make money and save money from it. If you are paying to capture data, then it is imperative that you utilise it in order to drive commercial advantage,” he said. Other speakers included retail analyst Dr Clive Black, who gave an overview of emerging retail trends and potential opportunities for local companies in the UK and Irish markets. Bank of Ireland UK’s Economist and Market Analyst, Alan Bridle, spoke about the strategic importance of the agri-food sector to the local economy, and explored the potential impacts of a changing economic landscape post-Brexit. The conference also heard the preliminary findings of a Deloitte report, commissioned by NIFDA, into the effect of Brexit on the sector. 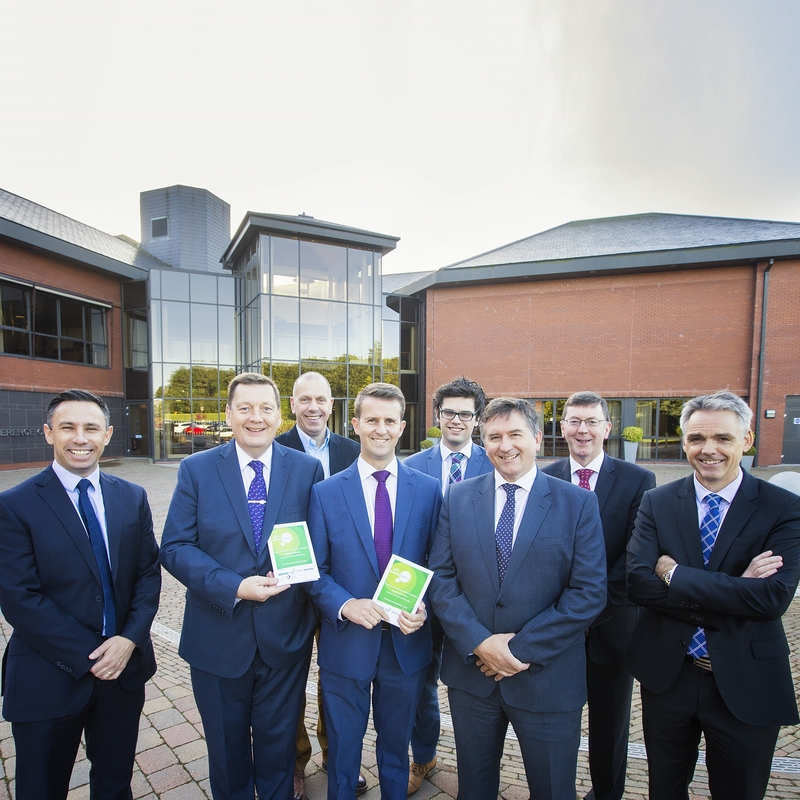 The report, which be officially launched later in the year, will incorporate feedback and concerns from the local industry and will explore priorities for the NI Executive moving forward in relation to supporting Northern Ireland’s largest manufacturing industry. Caption: From left to right, pictured at the Northern Ireland Food and Drink Association’s Annual Appetite for Growth Conference, Tony Brown, Commercial Manager, Sysco Software; Michael Bell, Executive Director, NIFDA; John Hood, Director of Food and Tourism at Invest NI; William Thompson, Head of Agri, Bank of Ireland UK; Jason Starbuck, Deloitte; Declan Billington, NIFDA Chair; Alan Bridle, UK Economist and Market Analyst, Bank of Ireland UK and Glenn Roberts, Partner at Deloitte.